If you read my previous post you'll remember that I am on a mission to use just a few, new and lovely products to create several Christmas themed projects! I have realized that I have SPHD (Seasonal Product Hoarding Disorder!) 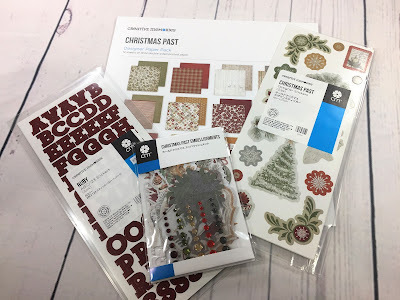 and I although I purchased the charming Christmas Past paper, stickers, embellishments and letter/number stickers*, I am trying hard to use them all up and not have any leftovers that will add to my seasonal product stash! As part of this quest, I am sharing all my project plans with you so you too can make the most of your Christmas products. 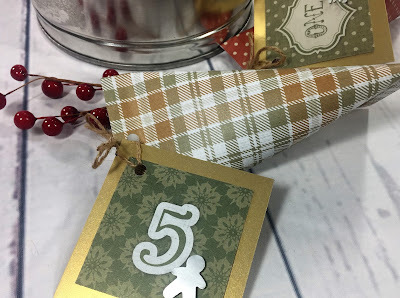 Today I'm going to show you how to make a quick and easy Christmas Countdown (which is similar to an Advent Calendar) using the same products we used to make the December Daily 2016 album. I want to be clear that you won't be able to make BOTH of these projects with the limited supplies we are using...you will have to make a decision and choose one or the other (I know...this is one of the difficult decisions we have to make when combating SPHD!). If you didn't get a chance to see how to make the December Daily Album, take a look at this post before you make your decision! 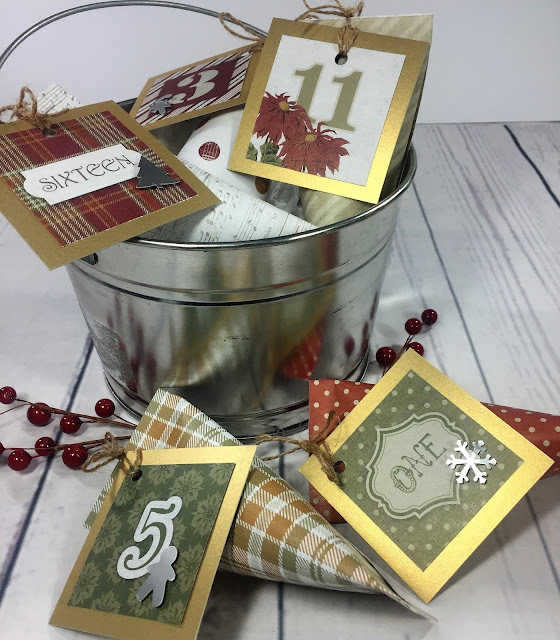 Christmas Countdowns and Advent Calendars are a fun way for kids to keep track of how many days there are until Christmas! I remember enjoying the chocolate-a-day calendars when I was little - each day I would open a little window on the cardboard box to reveal a tiny chocolate. I thought it was the best thing ever. Over the years I have done a number of variations on this theme (you can see some of them here) and this year I am liking the idea of creating easy paper favours that will contain an activity and a small treat for each of my boys. I made a video to show you the basic method for creating the favours, so grab a cup of tea or coffee and sit back for a few minutes to watch, then follow along for the materials and instructions below. You can also download and print a copy of the instructions here. Cut out 3” squares from your whole and half pieces of cardstock. Use the same method shown in Cutting Guide #1 for the December Daily album pages to make twenty-four 3” x 3” squares. Cut each of the remaining six sheets of double-sided paper into 6” x 6” squares. To make each favour: run adhesive down two of the 6” square. Roll one edge without adhesive towards one with adhesive and adhere it to the opposite edge forming a tube or cylinder. Press the bottom edge together to seal. Fill the empty tube with a treat such as a mini candy cane, chocolate bell, other candy or a small toy. If you want to avoid giving candy and more “stuff”, you can place a piece of paper in each favour with an activity suggestion such as “Popcorn and Movie Night”, “Take a drive to see the Christmas Lights”, “Make Christmas Cookies”, “Read a Christmas Story” etc. I created a printable list of activities last year that are included with the downloadable instructions for this project, and of course you can find lots of lists of activity suggestions on Pinterest. Once you have inserted your treat or activity, seal the other end of the tube closed with adhesive in the same manner, but press it closed the opposite way. This will create an attractive asymmetric “sour cream container” style of favour. Punch a hole in one of the sealed ends, then use yarn or twine to attach a square with the date on it. Place all your completed favours in a basket or bowl and keep it somewhere easily accessible. I hope you enjoy creating this easy project for your family. Remember to get it ready by November 30 so they can start opening the favours on December 1st! I'd love to hear you comment on your family's advent traditions below, or comment and share photos of your creations on my facebook group!